Former UFC women’s bantamweight champion Ronda Rousey was recently named the world’s most famous female athlete in a list compiled by ESPN. 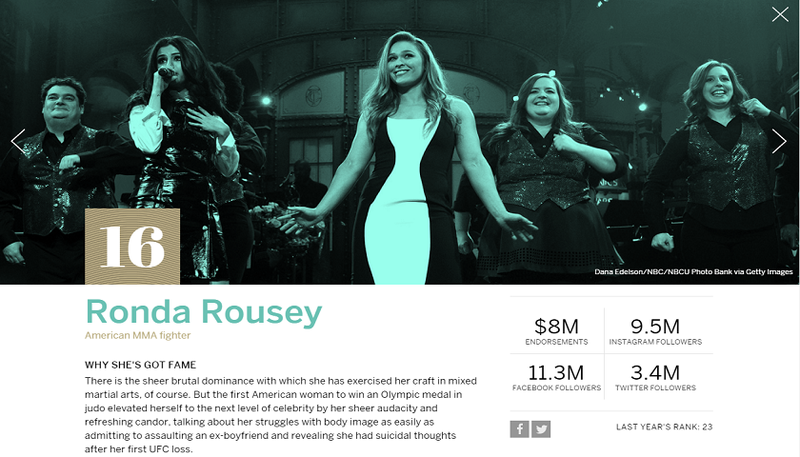 Rousey, comes in at number 16 on the list overall, and is joined by two other UFC athletes in the list of 100. UFC lightweight champion Conor McGregor is ranked as the 25th most famous athlete, and former middleweight champion Anderson Silva comes in at number 39. Rousey jumped seven spots from last year where she was number 23. McGregor rose 12 places in the rankings, and made the cut for the first time. Ben Alamar, ESPN’s director of analytics, devised a formula that combines endorsements with social media following and internet search popularity to create the ESPN World Fame 100 rankings. Famed boxer, Floyd Mayweather Jr., did not make the list as he is still considered to be retired. Rousey has not officially announced retirement, therefore she still made the cut. Also, it should be noted that salaries and earnings were not part of the factoring which likely helped increase the rankings of the UFC athletes.